Dymax Corporation’s has launched its Model 400 pneumatic, normally closed needle valve, which is designed to deliver precise dots or very fine beads of low- to medium-viscosity fluids. Accurate, repeatable dispensing can be achieved by utilising the valve’s material flow adjustment to control shot volume. The lightweight, wand-style valve body is compact and lightweight, making it easy and comfortable to handle. The Model 400 is available in several system packages, paired with the Dymax DVC-345 bench-top valve controller and material reservoirs of various styles and sizes. Additional accessories such as valve stands and various style dispense tips, are also available for this system. The Model 400 is CE marked and available globally. • Compatible with most standard fluid packages and delivery systems. 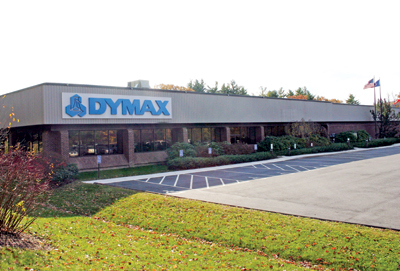 Dymax Corporation was originally founded in 1980 as the American Chemical and Engineering Company. Dymax owns over 30 technology patents. Its corporate headquarters is in Torrington, Connecticut (US) with additional facilities in Germany, China, Hong Kong, Korea, and Singapore.